Batley Bulldogs eased into the Coral Challenge Cup fourth round with a comprehensive victory over plucky Castleford amateurs Lock Lane at Fox’s Biscuits Stadium last Sunday. The Bulldogs ran in 11 tries, with returning winger Wayne Reittie bagging a hat-trick, as Batley gave themselves a real confidence boost following an indifferent start to their Championship campaign. It took Batley just four minutes to ease any nerves and hit the front as Alex Bretherton — another recalled to the Bulldogs starting line-up — was sent through the Lock Lane defence before putting supporting half-back Danny Yates over between the posts, with Dave Scott adding the first of four first half conversions. Scott turned provider with a lovely reverse pass which sent Tyler Dickinson over between the posts, to give the full-back another simple conversion. 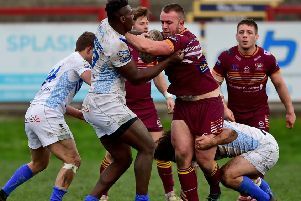 Batley repelled a spell of Lock Lane pressure as they moved down the slope and forced three sets close to the line but the defence remained solid. Having defended stoutly to keep their line in tact, Batley then extended their lead when a lovely sweeping move ended with Reittie scoring in the right corner. Scott landed the touchline conversion and Batley had breathing space at 18-0. Lock Lane’s efforts were rewarded when Connor Land produced a neat step to cross for a 33rd minute try which he converted. Batley rumbled back up the slope and having got into a decent position, substitute Michael Ward collected a short pass to crash over next to the posts and Scott’s simple conversion extended the interval lead to 24-6. Batley clicked into gear after the break as they ran in a further seven unanswered tries as the brave amateurs faded. Batley’s forwards proved too strong as they continually stormed down the slope to set up attacks. Reittie crossed for his second try two minutes after the re-start as Ward kept play alive. With Scott given a breather, Louis Jouffret took over the kicking duties to convert. Yates linked with Jouffret direct from a scrum 30 metres out and the Frenchman raced over for the try which he also improved. Batley’s impressive opening to the second half continued as they grabbed a fourth try in the space of just 15 minutes. Yates and Jouffret again linked as play was shifted wide for Sam Smeaton to score an unconverted try. Lock Lane were struggling to contain Batley’s powerful pack and they added a further three tries in the final 15 minutes. Batley brought up their half century in the 65th minute as more neat short passing saw them break through the Lock Lane defence and the move ended with Tom Hemingway crossing for the try and Jouffret added the goal. Another sweeping move from left to right ended with Smeaton crossing for his second try but it was too wide out for Jouffret to improve. Reittie had the last word a minute from time as Batley again moved play right and Brearley produced a fine cut out pass to send the winger over to complete his hat-trick. Jouffret added his fifth goal and it was job done as Batley eased into the fourth round, with the Bulldogs defence restricting Lock Lane to limited second half chances.